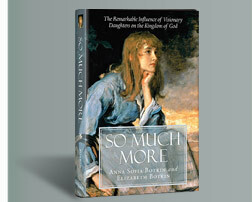 Coming Soon: Book Review of "So Much More"
So Much More, by Anna Sofia and Elizabeth Botkin, is about the role and impact that young ladies have in the Kingdom of God. I'll be reading this immediately after I finish It's (Not That) Complicated, and am really looking forward to it! Oh good! I was hoping you'd review this one. :-D We've got it, but I've never read it. Looking forward to seeing what you think of it!